As Valentine is coming up, I decided to write about the most gorgeous and romantic place I have been so far (jup, even more romantic than Paris if you ask me): Santorini! One of my Greek colleagues told me once about this Greek saying: Once you have been to Santorini with your partner, you either break up or you get married right after. Whether it are the beautiful sunsets above the clear blue sea, the gorgeous and charming villages, the unique volcanic beaches or the typical atmosphere of the Greek island, the island is just amazing to spend your vacation. People may see Santorini as a Luxury and relaxing destination, but there is also so much to do on this island. The wild scenery and impressive nature, created by the volcanic eruptions, is one of a kind. And thanks to its volcanic nature and volcanic history there are many activities to make sure you will not get bored on the island. You can climb up to the top of the red beach, admire the sunset in Oia, discover the Minoan city Akrotiri that was destroyed after a volcanic explosion, make a boat trip to the volcanic craters or to the hot springs or make a Stroll through lovely Fira. Let’s start with a stroll through Fira, The main city of the Island. This is where you will find the famous Greek white houses and blue domed churches. It is the only place on the island where you can actually shop, but keep in mind that spending your money here can be quite expensive. Luxury shops and jewelleries can be found everywhere in the cute small streets. The city also offers several tavernas and restaurants. 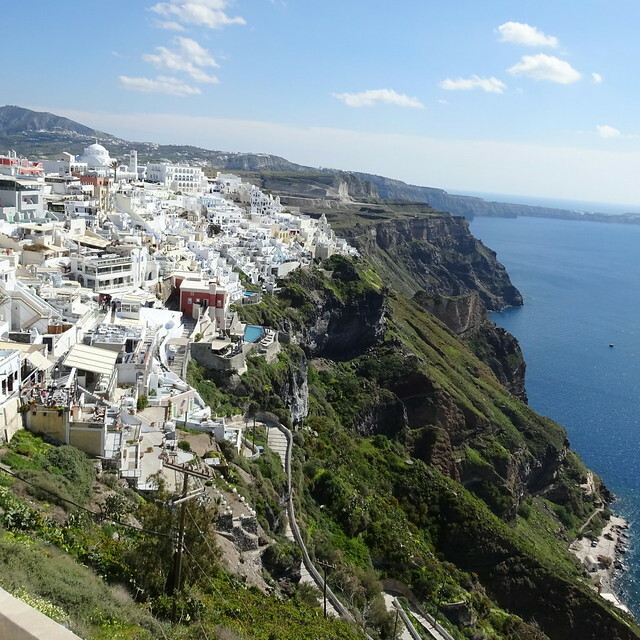 It is built on the cliffs of the crater of Santorini and while walking through the small streets you get frequently surprised by the amazing views on the rest of the islands, the white buildings and the clear blue sea. Also very impressive is the Metropolitan church, located on a square that offers a wonderful view on the caldera and the crater of the volcano. The church is decorated with beautiful arches that creates a peaceful courtyard. Inside the church is decorated with beautiful frescos which are surely worth to visit the cathedral. I am always a bit nervous when I spontaneously decide to go inside a church, but I have learned to don not worry too much. Greek people are very kind and willing to share their traditions in my experience. However, I do make sure that I dress myself appropriate. For history lovers the island offers Akrotori. An archaeological site of a city whose life came to an abrupt end when the inhabitants experienced several earthquakes. A huge volcanic eruption followed. Volcanic materials covered the whole island which protected the buildings and objects of the city up until now. Because of this the site is similar to the one in Pompeii, although no remains of human and animals are found, which indicates that the inhabitants where warned by the earthquakes and moved to a safer place. I really liked the visit to Akrotori as it learned me a lot about the Minoan civilisation which I didn’t know much about. Also I was very impressed by the idea that these people, that lived here about six thousand to five thousand years ago, where already building houses with several floors and had a wide network of external relations. You don’t need much of your imagination to see how those people lived in those days. Thanks to the thick layer of volcanic materials the city remains where good protected. Historical fact: Although the reason of the end of the Minoan period is unclear, many believe the theory that the collapse is caused by the eruption of Thera (Santorini). Professor Spyridon Marinatos did research about this theory. 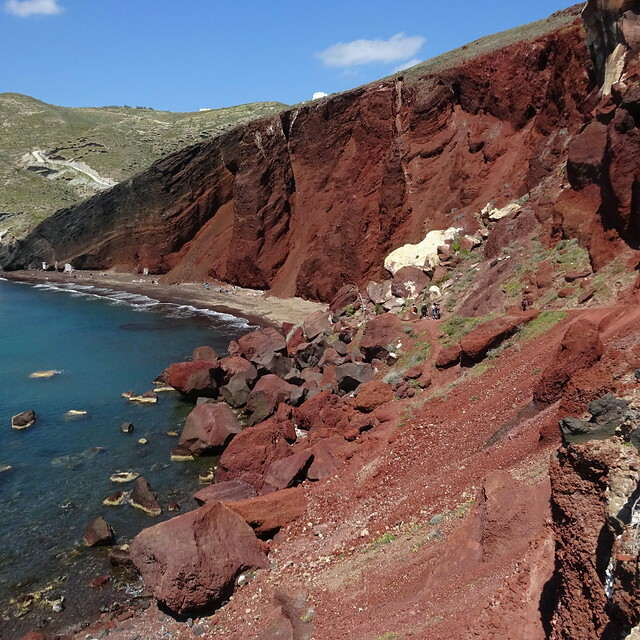 As the eruption is one of the largest volcanic explosions in recorded history it might be possible that volcanic ash from Thera choked off plant life on the eastern half of Crete, starving the local population. Another possibility is that the volcanic explosion generated a massive Tsunami which destroyed many Minoan settlements. In any case, evidence is found that indicates that the Thera eruption did not cause the immediate collapse of Minoan civilization but however, it did probably had a huge impact on the economic situation and the trade position of the civilization. There is nothing more romantic that enjoying a glass of wine while watching the sunset in Oia. 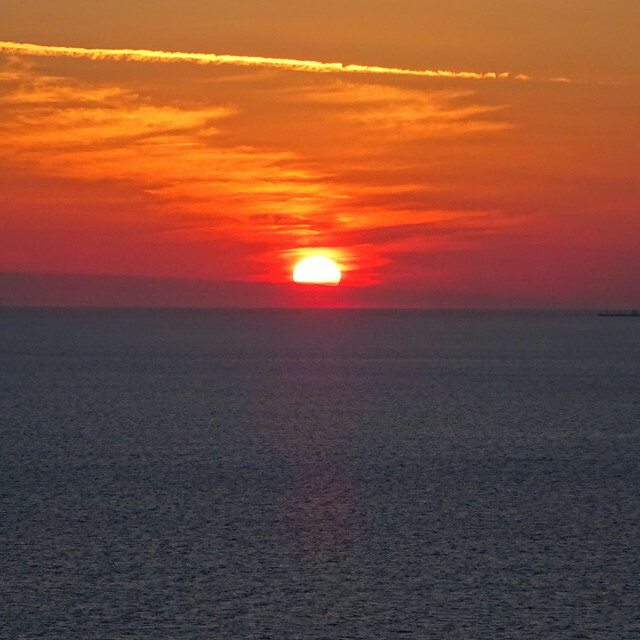 The most famous spot to watch the sunset is at the castle of Oia. And although it does have an amazing view, Ben and I decided that we found this place to crowded. While we walked through Oia we were looking for a place where we could have dinner and watched the sunset on the same time. We found the perfect place, and although the food was a bit expensive I do not regret any part of this decision. The food was better than anywhere else in Greece, the service was excellent and the sunset just stunning. We made a reservations just to make sure we had the perfect place for this lovely moment. As Ben and I wanted to see the crater of the volcano, we booked a boat trip that took us not only to the crater, but also gave us a change to swim to the hot springs. The boat trip to the crater was stunning. The closer we got to the crater, the better we could see that the crater was surrounded by a caldera with Santorini as the biggest part of the caldera. The walk to the crater was quite impressive, it is a bit tough as you have to walk upwards on mostly black volcanic stones. The volcano is still active and you can smell smoke that’s coming out of the crater. 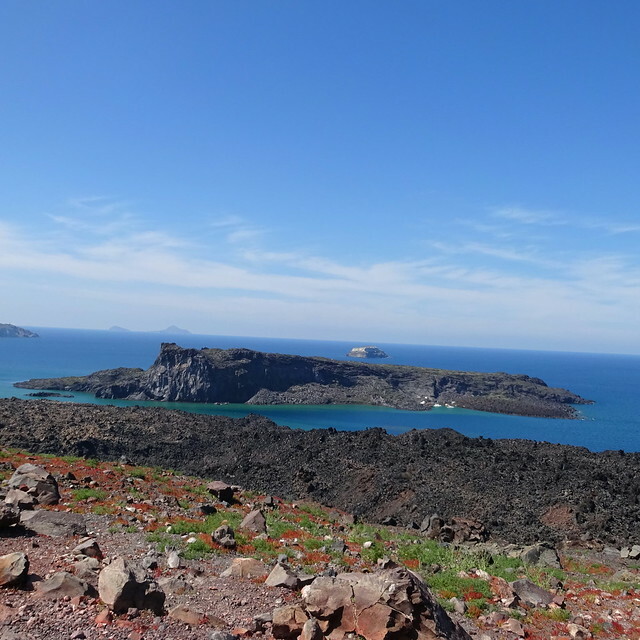 Once we had reached its highest point we had an stunning view, the black stones of the crater are in an impressive contrast with the clear blue water and we were completely surrounded by the caldera. After the visit to the crater the boat took us to the hot springs. It is not possible to go exactly to the hot springs by boat, and because of that we had to swim to them. This meant we had to jump into the water that was only 17 degrees (Celsius) and then swim to the hot springs, I cannot remember that I have ever swam that fast in my entire life, the water was really, really cold. You could hear everyone coming by as soon as we reached the hot springs, this was very relaxing. However, we still had to go back through the cold water to get to the boat. I was very lucky to have a boyfriend willing to share his warm coat with me afterwards! Although the water was really cold, it was a cool thing to do. If you are planning to swim to the hot springs, don’t wear your best swimsuit, as it will be covered with volcanic materials afterwards. Historical fact: About 3500 years ago, the volcano of Santorini or Thera erupted and exploded. It was one of the largest volcanic eruptions in recorded history. It destroyed the Minoan settlement on Akrotori and also created huge damages in the nearby areas. After the volcano exploded, it sunk in the sea and got filled with water from the sea. Nowadays you can only see the eastern edges of caldera and the crater. Some believe that there is a link between the eruption and the Book of Exodus in the Bible. Also there is some evidence that the myth of Atlantis is based on Santorini’s eruption. 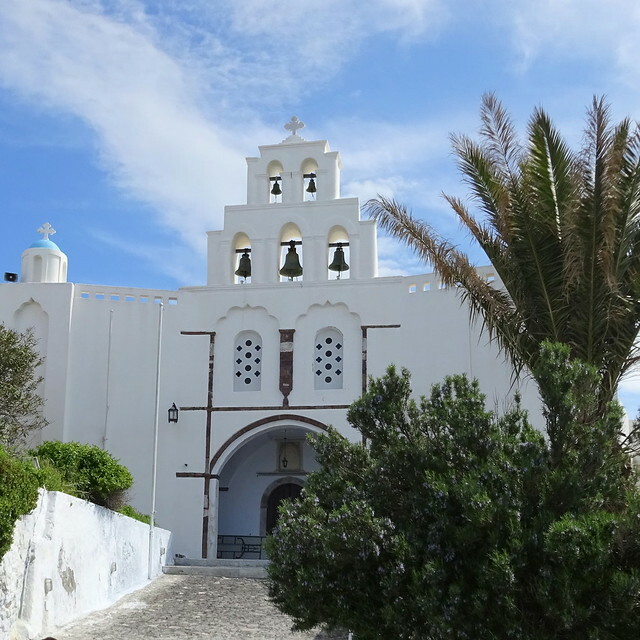 If you have, like my me, a soft spot for small villages I can recommend you to visit Pyrgos. The village itself is really cute and the old castle is just gorgeous. This was where Ben and I had or breakfast on our first day on Santorini. The village is not crowded which is a good thing as the streets can be very small. As on every Greek island, Santorini has a lot of beaches where you can relax, although the island doesn’t offer you huge sandy beaches. Very unique are the black beach and red beach. It’s pretty rocky, but the volcanic colours are in an amazing contrast with the blue sea. Ben and I walked up to the top of the red beach (which gave my lovely white sneakers a new red colour). The scenery of the beaches are pretty wild but absolutely stunning. Prices for food: A cheap meal will cost about €10,- and a Gyros lunch will cost about €4,-. Ben and I paid €60.- for our dinner in Oia. As Santorini is known as a luxury island prices can highly variate, but as most restaurants have an menu at the entrance you can check the prices before you decide where to eat. 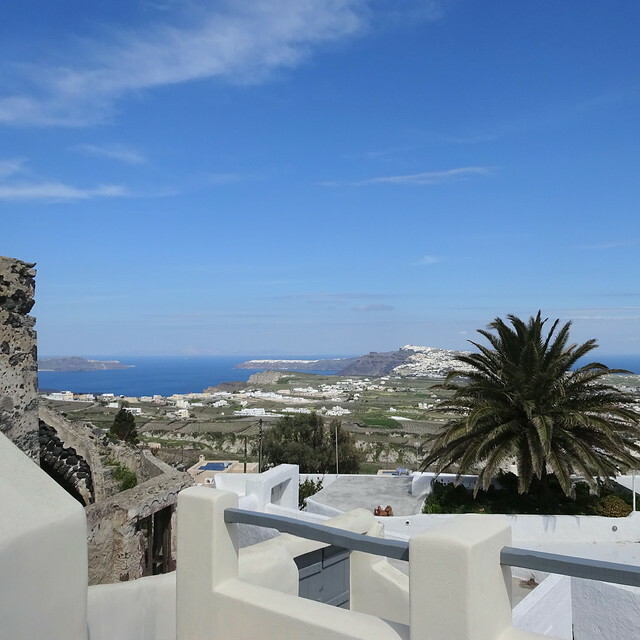 How much time you need: Ben and I spend a bit more than two days on Santorini island. This was enough time to do everything I have previously mentioned without being in a rush. However, there is a lot to do on the island and there are many opportunities for daytrips. You can easily spend a whole week on the island. How to get there: You can reach the island by boat. Ben and I always use the website of direct ferries (which you can find at the end of this page) to plan our boat trips. Direct ferries also has an useful application. Santorini also has an airport, Ben and I only payed €16,- each for a ticket from Athens to Santorini. Make a reservation: If you want to be sure you want to have the best place to admire the sunset, make a reservation. It is possible to plan a boat trip, these reservations should be made at least two weeks ahead. If you are planning to enjoy the sunset during dinner, make a reservation at one of the many restaurants at least a few hours before. Don’t go in high season: Santorini is a popular destination all over the world. Ben and I planned our trip in the beginning of April, which was perfect. I think we only experienced two crowded situations. We could easily walk through the streets. However, I have noticed that in high season the island is very crowded and the streets are completely filled with people. Go island hopping! The Cycladic islands of Greece are all pretty small and close to each other. Each Greek island has its own atmosphere, is you have at least one week, island hopping is great! You can choose to stay on Santorini and make daytrips to some nearby island, but Ben and I prefer to travel from one island to the other and stay at least two days on each island. Ask for help: Greek people are very kind if you threat them correctly. We booked an hotel room with AirBNB which was not expensive at all, but the hostess helped us with everything. She picked us up from the airport, booked our boat trip, explained us everything about the island, helped us out renting a car and arranged our trip to Fira for free. Vorig bericht Why you should definitely visit Thessaloniki!